for starters. But, ugh. Those feel so overused that I cringe applying them to a book that is so beautiful. So how about if I just SHOW you the cover. Whoa. Go back and read that aloud. Come on! It’s almost unfair how BR makes it look so easy. I don’t know about other writers reading this, but it makes me want to click back into my current works-in-progress and start over! Sigh. No wonder Mary GrandPré looked forward to bringing the story to life. Barb and Mary have both been kind enough to join us here on PBB to talk about Vincent Can’t Sleep. JE: What was the initial spark for this story? Had you always had a soft spot for Vincent or one of his paintings, or did something trigger your interest/focus? Barb Rosenstock: I wanted to write about Van Gogh WAY before I even thought about Kandinsky and The Noisy Paint Box. But all I knew was what I DIDN’T want to do. I didn’t want to repeat what had been done, so no focus on sunflowers. I didn’t want to make him a “crazy artist” but I also didn’t want to ignore his emotional issues since lots of kids deal with these kinds of issues in their own lives or family every day, and I have in mine also. Lots of folks with a spectrum of emotional issues do lots of great stuff in this world. It’s kind of a hot button topic to me that mental/emotional illnesses are stigmatized compared to physical ones. Anyhow, starting many years ago (my first notes are from 2010.) I read books, many of his letters (great site and translations online btw at vangoghletters.org) and started writing drafts in 2011. Many horrible drafts, each in its own horrible direction. I had the story chronological, then I had it focusing on school, on his faith, on his swirling thoughts, on the fact that his mother called him “starry-eyed.” For quite a while I had a focus on Vincent and Theo (and thank goodness that didn’t work out as a picture book because Deborah Heiligman’s brilliant Vincent & Theo is unsurpassable.) I finally put the whole mess into my “Things that Aren’t Working Out” file (it’s big…) and went on to other projects including the one that became The Noisy Paint Box. So…Mary Grandpré and I had never met before the Caldecott banquet in San Francisco in 2015. She and I decided to have breakfast one morning just to chat. As I remember it, she came downstairs and mentioned that she was having a hard time sleeping because she was completing paintings (like in her hotel room) for a new book. And I thought to myself, “wow, I wonder if that’s some brilliant artist thing…that they can’t sleep, I mean like even Van Gogh couldn’t sleep…holy sh&*, Vincent Can’t Sleep!” When I got home from the awards, I think it took roughly two weeks to put what had been utter chaos for years into place. Once you have an idea that fits, it just fits, it’s meant to be. JE: I love this! What kinds of things did you know for sure regarding Vincent’s insomnia, and what kinds of things did you have to fill in, if any? BR: The facts about his insomnia are just that, facts. Vincent and his family wrote at great length about his habits, sleeping, eating and otherwise, so he’s a fairly open book even at this historical distance. I think I “filled in” (if you want to call it that) only his babyhood (but we (my editor, Michelle Frey and I) felt that it’s a fact that, at times, all babies can’t sleep and are awake at night.) The rest— that his eyes looked like they changed color, his pattern of freckles, his sneaking out of the house at night (and being found in another COUNTRY!) his escapes from boarding school, his night painting, his framing with his hands, the details about the starry night, all that is real. I sometimes get comments that I use “fictional language” or “fictional techniques” but I don’t really get it…you tell a story, period. If everything you are saying is true, it’s nonfiction. If it’s made up, it’s fiction. If it’s made up but also true in parts it’s historical fiction (OK, those are simplified, but you get my take on the idea…) There is no reason that true stories can’t have beautiful language and imagery. JE: I totally agree. Could you talk about collaborating with Mary on this one? Was it different from your process for The Noisy Paintbox? BR: Only that I was equally impressed with her thought process but trusted her even more completely. This is the first time I have worked with the same artist on a different story and I just knew (as I was writing) what I thought Mary (in particular) would be good at (the rush of garden-named colors for example.) We’ve only spent a number of hours together, but I trust her. She is obviously a brilliant illustrator and painter, but even more so a brilliant visual thinker. Whatever is on the written page, Mary will bring MORE to it, much more. And I respect that she works hard, thinks it through, and brings her best. Van Gogh also worked HARD at his art. It wasn’t an accident, it wasn’t off the cuff AND it wasn’t all emotional. There are hours, days, weeks, and months of rational planning and practice in addition to letting the feelings flow. THAT is what makes a great artist and Mary is in that elite club. This book felt more like a partnership, a “this is what I think, what do you think?” kind of process. And I can’t wait ‘cuz we get to do it (at least) one more time! 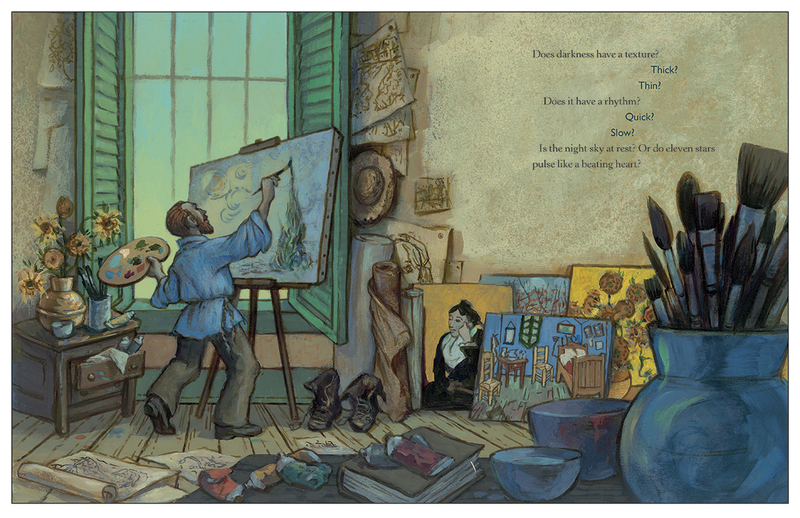 Having illustrated one of Barb Rosenstock’s stories before (The Noisy Paint Box), I knew that the story she wrote about Vincent was going to be equally wonderful. 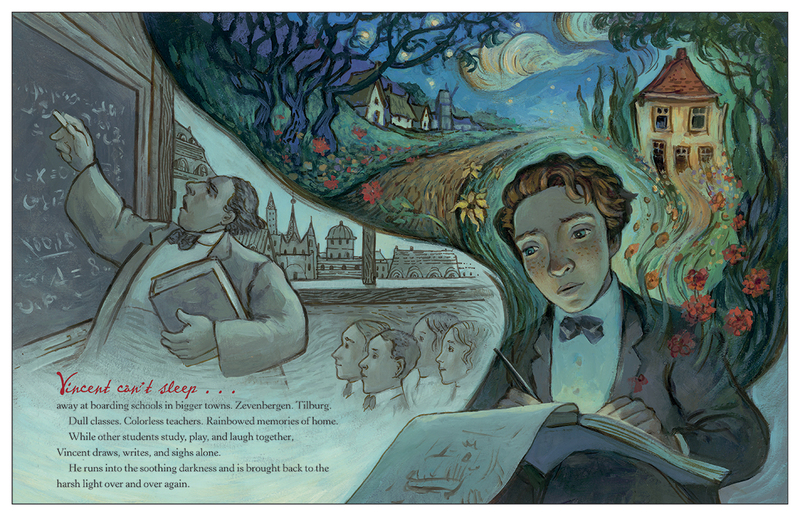 Her writing is truly visual… a real treat for an illustrator. The way she describes how a color feels, or how a shadow stretches across a landscape, or how the artist sees the path in front of them, inspires me as I come up with ideas for pictures. Barb’s relentless researching creates the base of the story… where she learns the personal side and the inner struggles of the artist. She then fashions it into a passionately told story that takes us through the life of this amazing human being, this prolific artist. 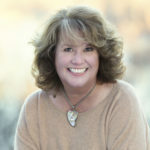 The way Barb writes allows me to connect with the artist, sparking my own creative flow to tell it visually. 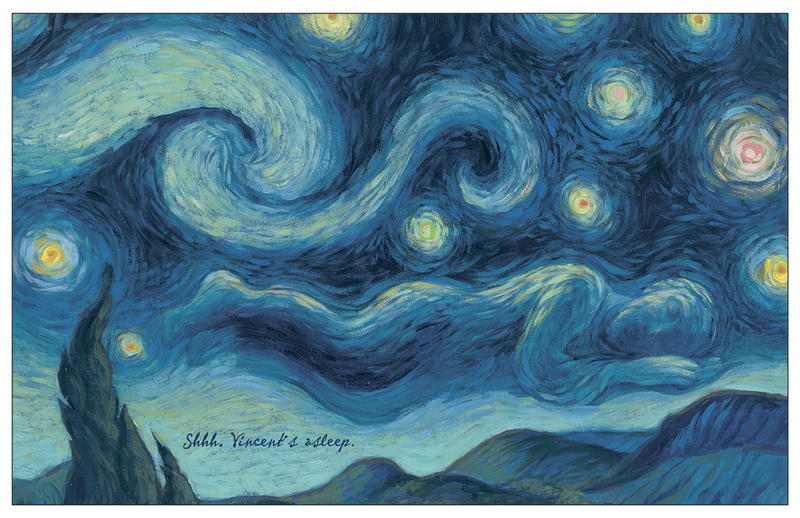 I was beyond thrilled to create art for “Vincent Can’t Sleep” since he is one of my all time favorite painters. Vincent Van Gogh’s unfiltered and emotionally charged paintings, combined with Barb’s ability to write with an intelligent and artful vision, brought a richness to the story of the artist that I could not resist. It was a pure joy to work on. As for collaborating with Barb on this book, I really didn’t get to work directly with her, but I felt I understood Barb enough to know where she was coming from, and I loved that Barb wanted to tell the personal story of Vincent,.. the human side, the side that speaks of his unrest, and emotional inner struggle. The fact that he could create from such a painful place and still create such beauty is inspiring. I knew that that was important to Barb, and so it was important to me as well, to show that in my artwork. Thank you, thank you, Barb and Mary, for joining us and giving us these behind-the-scenes glimpses. Hearing the personal tidbits that go into a story’s creation fascinates me (and our readers, too, I hope!). And oh, my gosh, I haven’t even talked about the amazing BACK MATTER! Readers, you’ll just have to check it out yourselves. Those of you who have entered recent contests will want to know who won. So here you go! Penny Parker Klostermann’s A COOKED-UP FAIRY TALE: Jennifer Rumberger. Kevan Atteberry’s I LOVE YOU MORE THAN THE SMELL OF SWAMP GAS: Debbie Tageson and Rebecca Boyer. Kevan has reached out via Facebook to let them know. 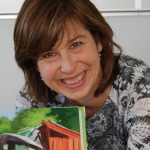 Barb Rosenstock, Jill Esbaum, Mary GrandPre, picture book biography, Vincent Can't Sleep. Bookmark. I can’t wait to read this, Jill. Thanks for sharing it! Gorgeous – From the images created with words to those interpreted through the illustrations. I can’t wait to get my hands on this book!! SO gorgeous. You’ll love it, Jane. A stunning resource for a project I have in mind, Jill. Perfect timing. Thank you. Serendipity. Love it when that happens, Karen! Feel free to use with students, children or grandchildren! Thank you Jill! I can’t wait to read this one. Such a lovely book! wonderful interview! Thank you for the post. Barb and Mary were so open – and enlightening, weren’t they? I am so very excited to read Barb’s latest! Super interview. Breathtaking! Goes right on top of my TBR pile, with great anticipation. Thank you for the lovely interviews. This looks like a stunning book! Thank you for your insightful interviews Jill. The creative process fascinates me, Lynn. So different for each of us. Thank you, Jill, for a great interview! Congratulations to both Barb and Mary for another fabulous collaboration!! What wonderful insight into the creativity the author used to find her way with this book and the illustrations and art that brings it to life. Looking forward to reading this and sharing it with my grandchildren. Hope they love it, Kim. Beautiful! I love the backstory to the creation of this gorgeous book. Thanks for sharing with us! You’re very welcome, Angie! Learning all of those details is so inspiring to me. I cannot wait to add this picture book biography to my library. The text and art work together so seamlessly you’d think Barb & Mary worked hand in hand throughout the process, Carmela. So stunning. Wonderful interview, Jill. I can’t wait to read the language and see the colors in this book. Loved the sneak peek of Barb and Mary’s VINCENT CAN’T SLEEP! I know I sounded gushy throughout, but wait till you see this one, Judy. It deserves gushing over! Once in a while we all need GUSHY just to keep going, no? Thanks Jill! I had the privilege of Barb’s on-target critique of one of my manuscripts. Such talent. She has set the bar high. This book sounds like a treasure. Thanks, Jill, for letting us hear from both writer and illustrator. You’re welcome, Sherri. She DOES set the bar high! And looking forward to your opinion, Cynthia! Oh my word. I have to order this right. NOW. Gorgeous. Language and art. Thank you for sharing. Jill, you had me at luscious. And I agree! This is a deliciously lovely book. Oh–this looks so lovely, Jill & my kind of book!! Thank you so much for sharing! Can’t wait to read it. The art is just stunning! I’m always on the look out for new PB bios. This looks like it may end up on my “favorites” list! This is one I want to add to my collection! Beautiful! I can hardly wait to get my hands on this one. I know that I will absolutely have to own it, however, I still requested that my library purchase it so others can read it as well. Congratulations and thank you for the great interview! I am dying to read this book. I adore “Stary, Stary, Night” and Vincent. Thank you for this review. Wow! I can’t wait to add this one to the collection! Thanks for sharing! I can’t wait to read the story and study the illustrations. it’s on order. Thanks for providing the background. I love hearing the back story. Can’t wait to read this beautiful book. Thank you! Recently I read VINCENT AND THEO: THE VAN GOGH BROTHERS by Deborah Heiligman. 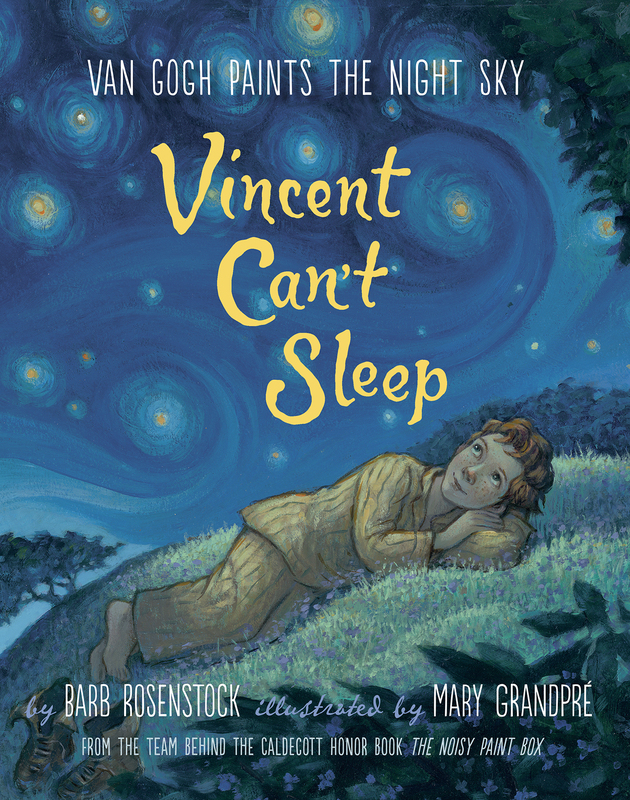 I just know I must read VINCENT CAN’T SLEEP by Barb Rosenstock and illustrated by Mary Grandperé. 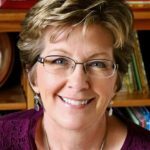 Thank you, Jill, for sharing a lovely glimpse of Barb’s lyrical writing and Mary’s stunning illustrations. Thank you, Jill, for showcasing this book. I can’t wait to take it all in–just stunning! Wow! This is a great interview and information. So beautiful. I know this one will be a purchase. Thanks, Jill! The descriptions of this book sent me immediately to my library to reserve it! I’m glad Barb didn’t gloss over the emotional issues. Based on the preview you’ve given in just this post alone, I’ve got to buy this book! And what an intimidating challenge it must have been to create illustrations of one of the most famous painters and his paintings. It looks amazingly handled, by both Barb and Mary. Thanks for sharing, Jill! I can’t wait until the UPS driver brings this to my door! I seldom order picture books sight-unseen, but I knew this would be phenomenal. Thanks for the interview, Jill. And thanks Barb and Mary for sharing your journey with this book! Congratulations to both of you! You have pulled off a very fitting tribute to an amazing artist. Thank you for sharing your talents!!!!!! 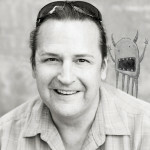 Thanks Jill, for this deservedly ‘gushy’ post! An inspiring story on many fronts. A poster of Vincent’s Starry Night followed me throughout my college years and was later passed along to my artist daughter. How’s that for generational inspiration?! Will definitely be looking for this one.